Central Aroostook's Brendan York threads the needle of Richmond defenders including Nate Tibbetts, left, Kyle O'Brien, center, and Randy Moody, right, as he scores in the first half of the Boys Class D State Championship game at the Bangor Auditorium on Saturday, March 5, 2011. 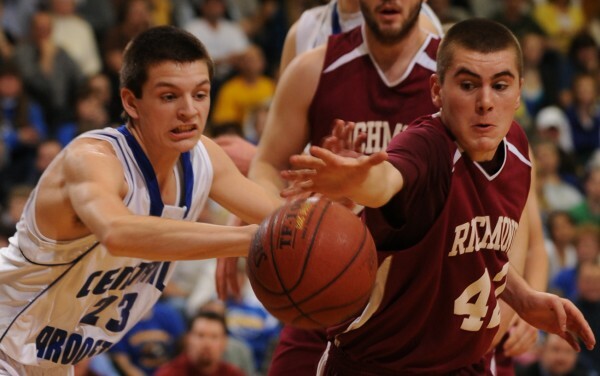 Central Aroostook's Steven Decker and Richmond's Thomas Carter scramble for a loose ball on Saturday, March 5, 2011 at the Bangor Auditorium during the Boys Class D State Championship game. Central Aroostook won 40-37. BANGOR — Championships are often won and lost in the trenches, and the Central Aroostook boys basketball team prevailed Saturday afternoon. 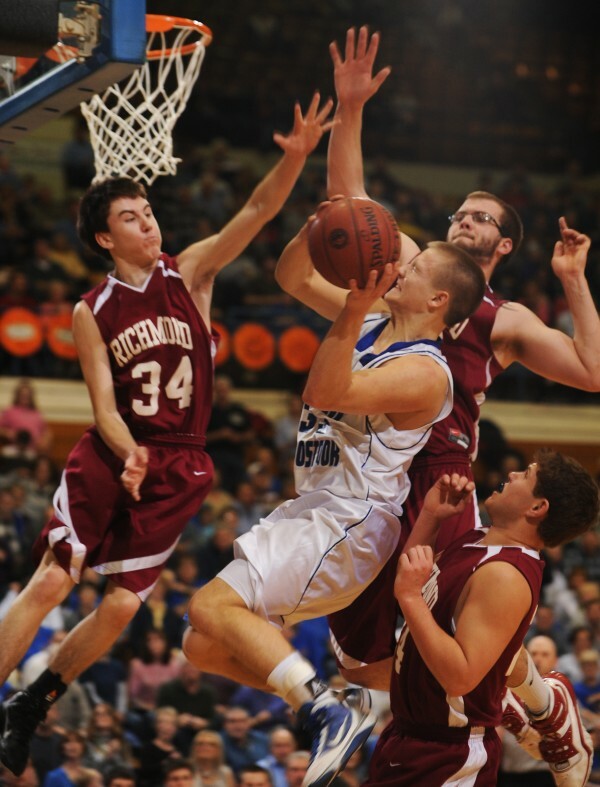 The Panthers from Mars Hill raced out to a 19-point lead in the third quarter, watched as Richmond sliced it to three and held on to return to the top of the Class D hoops mountain for the first time since 2008 with a 40-37 victory at the Bangor Auditorium. That caps a perfect 22-0 season for coach Tim Brewer’s club, while Richmond concludes the season 16-4. Richmond struggled offensively throughout the game but finally started getting it going in the fourth quarter, holding CAHS to two field goals in the final period. Bobcats’ senior guard Tom Carter scored six of his 11 points in the final quarter, including an offensive putback with 36 seconds to make it a one-possession game for the first time since the first quarter. That was a big difference from the first half, in which Richmond found itself in foul trouble and Central Aroostook was attacking the basket with regularity. “They mostly started penetrating a lot more, that put pressure on our defense and they got us in foul trouble,” said CAHS senior forward Caleb Kelly, who led all scorers with 14 points. After the Panthers turned it over on their next possession, they turned to their defense, extending out on the perimeter while Michael Christie’s game-tying attempt with four seconds left missed everything. Knowing that Richmond had no timeouts left in that situation, the Panthers keyed on the 3-point line and the Bobcats couldn’t get a decent look at the hoop. “They were looking for a three and the kids did an excellent job defending,” said Brewer. Central Aroostook led 35-18 after a driving layup by Kelly late in the third, but the Panthers would score only five points the rest of the way while Christie got hot for Richmond, scoring all 12 of his points in the second half. “Mike did a nice job of attacking and Kyle (O’Brien) stayed in the game with four fouls,” said Richmond coach Phil Houdlette. The Panthers showed off the defense that got them here early on, holding Richmond to two field goals over the final 7:18 of the opening half while blazing to a 25-10 lead at the break. That was mainly thanks to the inside play of the 6-foot-6 McClung, who gathered eight offensive rebounds in the first half and dished out two assists. McClung found Kelly for a backdoor layup with 2:40 left in the half to give Central Aroostook a double-digit lead. Richmond was hampered by foul trouble early and often, with senior point guard Christie picking up three fouls in the opening quarter, while two other Bobcat starters picked up at least two in the first half. Central Aroostook took advantage of that at the line, going 11-of-16 from the stripe while forcing 10 turnovers on the defensive end. The problem was, the Panthers shot just 7-of-30 from the field in the first half, which allowed the Bobcats to stay in striking distance. McClung wound up with nine points and 11 rebounds for Central Aroostook while Brendan York tallied eight points and Logan McLaughlin seven. Even though the stats weren’t up to the Panthers’ usual standard, the only one that mattered to them was the final score. “Everyone on this team wanted that gold ball, we wanted it and we got it,” Kelly said. McClung also did a solid job defensively on Richmond’s O’Brien, who is 6-5, holding him to seven points on 2-of-8 shooting. Christie wound up with 12 points to lead Richmond, while Carter had three steals and nine rebounds. Kyle O’Brien gathered nine boards.